This study aimed to identify the physiotherapy exercise rehabilitation services available to patients with cancer in Ireland and to identify barriers to the provision of services. Physiotherapy department managers in specialised cancer centres, public and private hospitals and palliative care settings were surveyed to establish the availability of exercise rehabilitation services for patients with cancer. Of 40 managers contacted, 24 responded providing information about 26 services. Ten services employed a dedicated oncology physiotherapist. Exercise classes were offered to patients with cancer by five services, primarily within the palliative care setting. In the 17 hospitals which provided surgery, ten provided oncology specific post-operative exercise rehabilitation and one offered a prehabilitation programme. Limited human and physical resources and absence of established physiotherapy pathways were cited barriers to service provision. Exercise rehabilitation is not an element of standard care for patients with cancer in Ireland. According to the National Cancer Registry the lifetime risk of an invasive cancer diagnosis in Ireland is approximately 1 in 3 for men and 1 in 4 for women1. The disease itself, in addition to the most commonly used curative therapies may result in a range of physical and psychological sequelae including pain, fatigue, impaired cognition, peripheral neuropathies, increased body fat, decreased muscles mass, reduced bone strength and lymphedema2. Exercise rehabilitation, throughout the cancer care continuum and into survivorship may ameliorate many of these side effects2. Exercise programmes have been shown to improve quality of life, physical functioning, aerobic exercise and fatigue levels 3,4,5 and may also reduce rates of disease recurrence and mortality6,7, 8, 9. Exercise is reported to be safe and beneficial both during and after cancer treatment 2,10. The American College of Sports Medicine (ACSM) and The British Association of Sports and Exercise Sciences (BASES) suggest that in the absence of formal guidelines, patients with cancer should aim to achieve the exercise guidelines of the general population i.e. 150 minutes of moderate to vigorous physical activity per week in addition to strength and flexibility training2,10. For those who are generally unwell and unable to participate fully in the activity recommendations, it is advised that sedentary behaviours are limited10. There is limited knowledge regarding exercise rehabilitation services for patients with cancer in Ireland. Five studies investigating the availability of exercise therapy in oncology rehabilitation have been performed in America, the United Kingdom, Japan, Canada and Australia and have identified limited availability of exercise rehabilitation programmes11,12,13,14,15. The National Cancer Strategy for Ireland 2017-2026 emphasises cancer survivorship and the supportive role of physical activity in cancer survivorship16, however the availability of exercise rehabilitation for patients with cancer within the Irish health care system is unknown. This study examined the availability of physiotherapy led exercise rehabilitation for adults with cancer within hospitals delivering cancer treatment and hospices in Ireland using semi structured interviews17. Physiotherapy managers in public and private hospitals with a fulltime, visiting or part-time medical oncology/haematology consultant and all inpatient hospices were invited to participate. Paediatric services, private physiotherapy practices and private rehabilitation centres were not surveyed as the primary focus was on the availability of inpatient adult services in places where treatment for cancer occurred. Services were identified through online searches and review of the Health Services Executive (HSE) National Cancer Control Programme (NCCP)18. In total nine cancer centres and fifteen public hospitals as described by the HSE NCCP were identified. Seven private hospitals were identified through online searching and nine inpatient hospices were identified through the Irish Hospice Society website19. The Total Design Method described by Dillman20 was incorporated in order to maximise response rate to email invitation. This involved personalising initial emails conveying to the reader that their participation was contributing towards the solution of a problem with which they could identify. Ethical approval was obtained from Trinity College Dublin, School of Medicine Research Ethics Committee. Consent was implied by response to the initial email. Semi-structured interviews were conducted according to a standardised template aiming to identify physiotherapy staffing levels and to capture the availability of exercise rehabilitation and the types of services and programmes available. Physiotherapy interventions included preoperative assessments and exercise interventions to optimise surgical candidacy (prehabilitation), postoperative respiratory management, mobilisation and exercise therapy, and exercise interventions to support patients either during adjuvant therapy or in survivorship. Semi structured interviews were then completed over the phone. As questions can be varied and altered during an interview, validity and reliability depends on equivalence of meaning rather than the repeated use of the same words in each question. Questions were discussed by researchers to ensure uniform understanding and interpretation of questions in order to standardise the interview and facilitate comparability between the data collected by the various researchers. The interviews were transcribed verbatim and recordings were deleted. Transcripts were studied line by line. Data regarding service provision and staffing was extracted and themes were identified using thematic analysis as described by Braun and Clarke21. Transcripts were then re-read to ensure all relevant information was included. Managers of 40 physiotherapy services were contacted by email. Among the hospice services, seven managers were responsible for nine hospices. Therefore, 24 managers were interviewed, providing information about 26 services. The overall response rate was 65% (Table 1). Eight of the nine physiotherapy managers from cancer centres were interviewed. Of the eight services, seven had a designated oncology physiotherapist, ranging from a 0.5 whole time equivalent (WTE) basic grade to 3.0 WTE senior physiotherapists. None of the cancer centres providing surgery reported a formal exercise prehabilitation service, however four reported completing routine pre-operative assessments for patients with certain cancers, namely breast, prostate or pancreatic. All seven cancer centres providing surgery offered standard post-operative care to their patients and six of those offered oncology specific exercise rehabilitation for patients with specific cancers in addition to standard care. Five centres offered this service to post-operative breast cancer patients focusing primarily on lymphodema management or shoulder exercises. One centre provided oncology specific exercise rehabilitation for patients’ post-surgery for gynaecological cancer and one centre provide such services for post-surgical prostate cancer patients. Physiotherapy services for patients during chemotherapy and radiotherapy were routinely available in five centres. No centre had exercise classes available for patients with cancer. There was a response rate of 47% from managers within public hospitals excluding cancer centres. There were no designated oncology physiotherapists within the public hospitals interviewed. One physiotherapy department provided pre-operative assessments for patients with esophageal cancer. In surgical centres standard post-operative respiratory and mobility care was offered as part of the physiotherapy respiratory service however no formal exercise rehabilitation specific to cancer diagnosis was provided. Physiotherapy service was available during chemotherapy/radiotherapy treatment in four of the seven public hospitals and none of those interviewed had exercise classes available to their patients with cancer. Managers from five private hospitals were interviewed giving a response rate of 71%. A designated oncology physiotherapist was available in three hospitals. Routine preoperative assessments and prehabilitation programmes were available in one hospital and standard post-operative care was available in all hospitals. Four hospitals provided exercise rehabilitation for their patients with breast cancer. Post-operative exercise rehabilitation was routinely available to all patients with cancer in one hospital. Physiotherapy services were available to patients undergoing chemotherapy and radiotherapy in all hospitals and group exercise programmes were offered by one private hospital. Each physiotherapy manager in the six hospices interviewed had a palliative care senior physiotherapist within the service. Physiotherapy was provided on a blanket referral basis in four hospices. Home visits were carried out by two of the hospices. Rehabilitation programmes were available within the hospice service with three offering classes including tai-chi, mobility classes and education regarding transfers. These programmes were not exclusively for oncology patients, however managers were confident that the majority of their caseload included patients with cancer. Four main themes emerged; service provision, sub-optimal inter-professional communication, barriers to service development and follow up of patients post discharge from acute services. Service provision was not uniform across the sector. Many patients undergoing chemotherapy and radiotherapy were not referred to physiotherapy and physiotherapy was often used to treat patients after adverse events such as falls rather than acting preventatively. Gaps in the service included a lack of nationwide lymphoedema care and pre-operative prehabilitation programmes. Several managers reported not having the capacity to offer services to patients receiving chemotherapy on an outpatient basis. Concerns about inter-professional communication were identified whereby physiotherapy was not always viewed as a core member of the oncology team. Barriers to developing and delivering exercise rehabilitation included low staffing levels and the limited resources such as gym space. The absence of an established physiotherapy pathway for patients throughout their cancer care was also mentioned. This study identified that physiotherapy led exercise rehabilitation services available to patients with cancer in Ireland are limited. 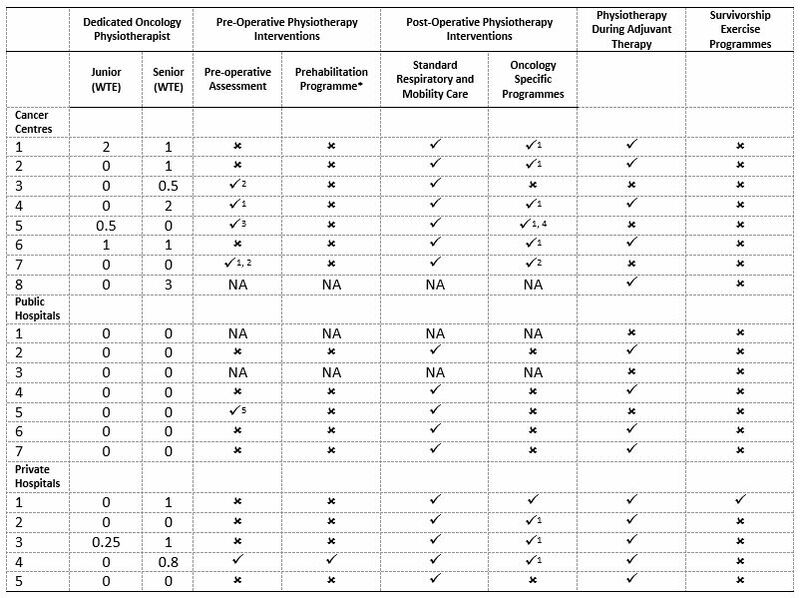 The results of this study highlight an emphasis on services for post-operative care with gaps in provision of prehabilitation and rehabilitation into survivorship. Within the 20 hospitals studied, only one oncology exercise class was identified. These results mirror the lack of structured group exercise rehabilitation internationally, with just 31 exercise classes identified from the 202 services contacted in Australia15 and 20 rehabilitation classes identified from of the 62 services contacted in Canada14. Limited availability of services was evident across the entire cancer trajectory and can be most clearly seen by the lack of prehabilitation services available despite evidence suggesting that prehabilitation has a role in reducing post-operative complications22,23. Although many of the cancer centres and private hospitals had designated oncology physiotherapists, several reported that they did not have the capacity to see patients receiving chemotherapy on an outpatient basis despite the proven role of exercise during active cancer treatment3. In palliative care it was seen that patients are often referred when they have severely limited mobility or have suffered an adverse event such as a fall despite the fact that exercise interventions may prevent such adverse events and have proven to be safe, feasible and beneficial in patients with advanced stage cancer 9,24,25. In addition to staff shortages, limited gym space inhibited the ability to run exercise rehabilitation programmes. Poor inter-professional collaboration and a lack of support from multidisciplinary team members was also described. Education of other multidisciplinary team members including oncologists and oncology nurses on the role of physiotherapy and the benefits of exercise therapy may be a vital step in ensuring that all appropriate patients are referred to physiotherapy and that patients receive clear, consistent messages about exercise. In the absence of physiotherapy led exercise rehabilitation for patients with cancer, the void may be filled by private rehabilitation services or non-physiotherapy led services. Consideration should be given to the fact that while private rehabilitation may be feasible for some patients, there is a need for rehabilitation for all patients with cancer including those during treatment. Despite the evidence for exercise rehabilitation, it is not an element of standard care in Ireland. The identification of the lack of exercise rehabilitation available for patients with cancer may be a useful step in guiding the development of these services with the aim that exercise rehabilitation should be recognised as standard care for all patients with cancer in Ireland. There were a number of limitations to this study. Some centres may have been excluded as participants were identified through online searches as there is no central database available for physiotherapy services for patients with cancer. In addition to this the availability of such services within the private and community care setting was not captured, thus highlighting an area for future research. In addition this, future research is needed to identify what multidisciplinary rehabilitation services are available to these patients given the complex needs of this cohort. Despite these limitations this study provides a foundation for future work exploring the availability of exercise rehabilitation for patients with cancer. 2. Schmitz KH, Courneya KS, Matthews C, Demark-Wahnefried W, Galvão DA, Pinto BM, Irwin BM, Wolin KY, SegaL RJ, Lucia A, Schneider CM, von Gruenigen VE, Schwartz AL. American college of sports medicine roundtable on exercise guidelines for cancer survivors. Med Sci Sports Exerc. 2010;42(7):1409–26. 3. Mishra SI, Scherer RW, Snyder C, Geigle PM, Berlanstein DR, Topaloglu O. Exercise interventions on health-related quality of life for people with cancer during active treatment. Cochrane Database Syst Rev. 2015;(8). 4. Mishra SI, Scherer R, Geigle P, Berlanstein D, Topaloglu O, Gotay C, Snyder C.  Cochrane Review Brief: Exercise Interventions on Health-Related Quality of Life for Cancer Survivors. Online J Issues Nurs. 2012;18(3):1. S, Gilchrist L, Jones L, Padgett L, Wolf T, Winters-Stone K, Campbell G, Hendricks J, Perkin K, Chan L. Toward a National Initiative in Cancer Rehabilitation: Recommendations From a Subject Matter Expert Group. Arch Phys Med Rehabil .2016;97(11):2006–15. 6. McNeely ML, Campbell KL, Rowe BH, Klassen TP, Mackey JR, Courneya KS. Effects of exercise on breast cancer patients and survivors: a systematic review and meta-analysis. CMAJ. 2006;175(1):34–41. 7. Holick CN, Newcomb PA, Trentham-Dietz A, Titus-Ernstoff L, Bersch AJ, Stampfer MJ, Baron J, Egan K, Willett W. Physical activity and survival after diagnosis of invasive breast cancer. Cancer Epidemiol Biomarkers Prev. 2008;17(2):379–86. 8. Hojman, P., Gehl, J., Christensen, J. and Pedersen, B. (2018). Molecular Mechanisms Linking Exercise to Cancer Prevention and Treatment. Cell Metabolism, 27(1), pp.10-21. 9. Cormie P, Zopf E, Zhang X, Schmitz K. The Impact of Exercise on Cancer Mortality, Recurrence, and Treatment-Related Adverse Effects. Epidemiologic Reviews. 2017;39(1):71-92. 10. Campbell A, Stevinson C, Crank H. The BASES Expert Statement on exercise and cancer survivorship. J Sports Sci. 2012;30(9):949–52. 11. DeLisa JA. A history of cancer rehabilitation. Cancer. 2001;92(4 Suppl):970–4. 12. Stevinson C, Fox KR. Role of exercise for cancer rehabilitation in UK hospitals: A survey of oncology nurses. Eur J Cancer Care (Engl). 2005;14(1):63–9. 13. Hamaguchi T, Okamura H, Nakaya N, Abe K, Abe Y, Umezawa S, Kurihara M, Nakaya K, Yomiya K, Uchitomi Y. Survey of the current status of cancer rehabilitation in Japan. Disabil Rehabil. 2008;30(7):559–64. 14. Canestraro A, Nakhle A, Stack M, Strong K, Wright A, Beauchamp M, Berg K, Brooks D. Oncology  rehabilitation provision and practice patterns across Canada. Physiother Canada. 2013;65(1):94–102. 15. Dennett A,  Peiris C , Shields N, Morgan D, Taylor, N. Exercise therapy in oncology rehabilitation in Australia: A mixed-methods study. Asia Pac J Clin Oncol 2016. 23. Moran J, Guinan E, McCormick P, Larkin J, Mockler D, Hussey J, Moriarty J, Wilson F, The ability of prehabilitation to influence postoperative outcome after intra-abdominal operation: A systematic review and meta-analysis. Surg 2016;160(5):1189–201. 24. Oldervoll LM, Loge JH, Paltiel H, Asp MB, Vidvei U, Wiken AN, Hjermstad MJ, Kaasa S. The effect of a physical exercise program in palliative care: a phase II study. Journal of pain and symptom management. 2006 31;31(5):421-30. 25. Albrecht TA, Taylor AG. Physical activity in patients with advanced-stage cancer: a systematic review of the literature. Clinical journal of oncology nursing. 2012 Jun 1;16(3):293.